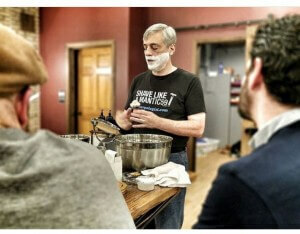 You are here: Home / Shaving / Counterfeit Shaving Brushes?!? I’ve heard of knock-offs of name-brand shoes, purses, and watches. But shaving brushes? Apparently someone is trying to pass off fake Shavemac shaving brushes. 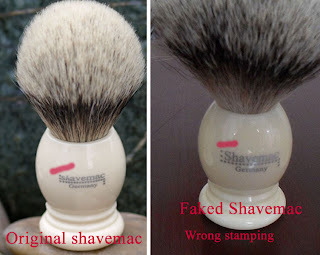 More information on spotting the fakes can be found HERE on Shavemac’s site. Be sure to buy your shaving products from reputable vendors. Where there is a surplus of factories, there will be counterfeits galore! I occasionally get proposals from vendors in China and India who find RetroRazor to import fake Mach3 and Fusion cartridges and Panasanic electrics – they obviously haven't read our anti-cartridge/electric screeds – but in any case, it is pesky. Fortunately no fake Weishi's, Derby's, Personna's or Dorco's for us!